Combine the ground meat, rice, eggs, chopped rosemary and oregano, grated cheese, canned tomatoes (with the juice) salt and pepper in a large bowl. Mix together gently using your hands until the ingredients are well mixed. Form the meat mixture into 2 to 2 ½ inch balls. You should end up with 12 to 14 meatballs. 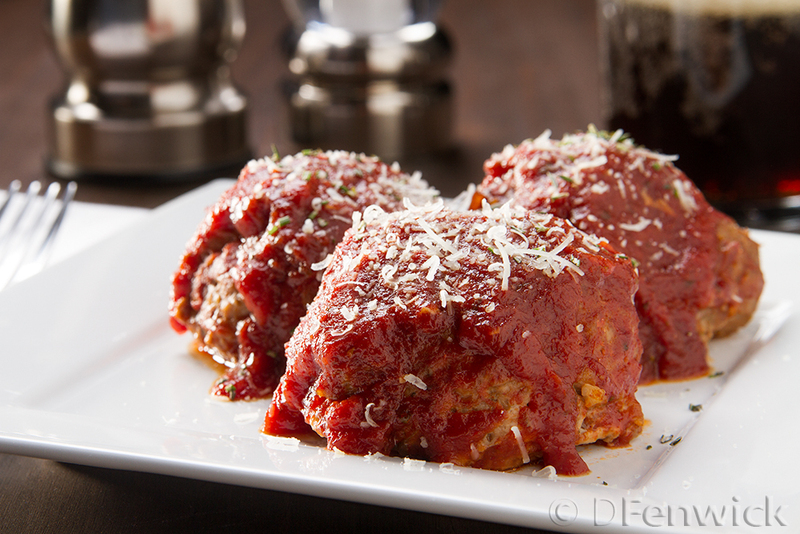 Place the meatballs into your baking dishes so they aren’t crammed together. Place in the oven and back for 30 minutes or until they start to brown on top. While the meatballs are cooking, make your sauce. Combine the tomato sauce, chopped herbs, balsamic vinegar and honey in a medium sauce pan over medium heat. Add the baking soda a teaspoon at a time. (This will neutralize the acid in the tomato sauce.) Stir in gently. Once it has stopped foaming, add the second teaspoon and mix it in. Once the sauce is hot, taste and add salt and pepper. Turn down to low and let simmer. Once the meatballs have started to brown, spoon about half your sauce over the meatballs and return them to the oven. Cook another 20 minutes or until the internal temperature of the meat is 160 degrees. 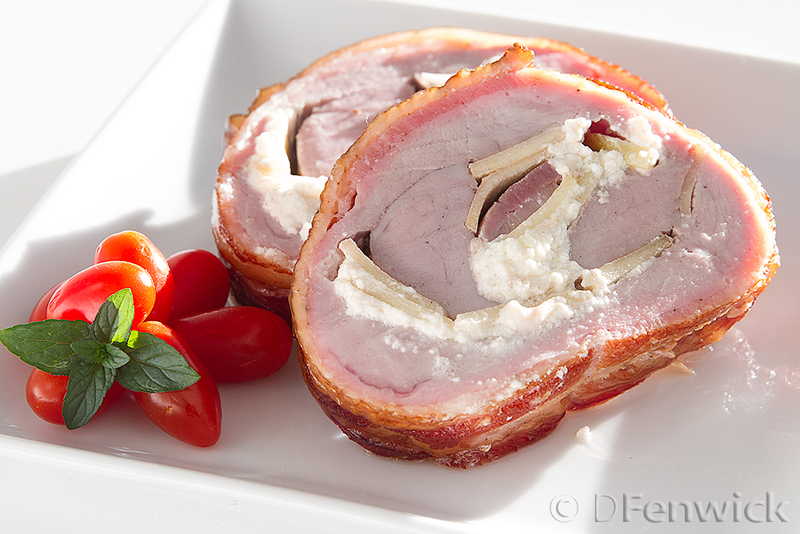 This week’s recipe is a scrumptious porky-extravaganza – pork wrapped in bacon. Seriously, we’ve got “major” amounts of bacon here. Oh and there’s cheese, tangy goat cheese in the middle. Did you see the smoke ring? This is one tasty treat. Let’s get cookin’! Useful smoker tip: Be sure to prepare the wood for your smoker by soaking it in water over night. Light the fire in your smoker so it can come to temperature while you work on the rest of the food preparations. Cut the apple into thin slices, the thinner the better. Now, lay out the two pieces of tenderloin so they roughly make a rectangle. Spread the goat cheese on the meet as shown, then lay out the apple slices as I’ve demonstrated, covering the meat completely. Sprinkle the apple with cinnamon. Add a slice of bacon on the side towards you, this is where you will start rolling up the pork loin to make the roulade. Carefully roll up your tenderloin and temporarily tie to keep it from unrolling. This is just to hold it in place while we do the next step. Now lay out your bacon as shown and sprinkle with salt and pepper. Place the tenderloin on the bacon and begin wrapping the bacon slices around the tenderloin. Use a toothpick to hold the bacon in place. Remove your ties as you go, you don’t want to have someone cut into their dinner and find the string under the bacon. 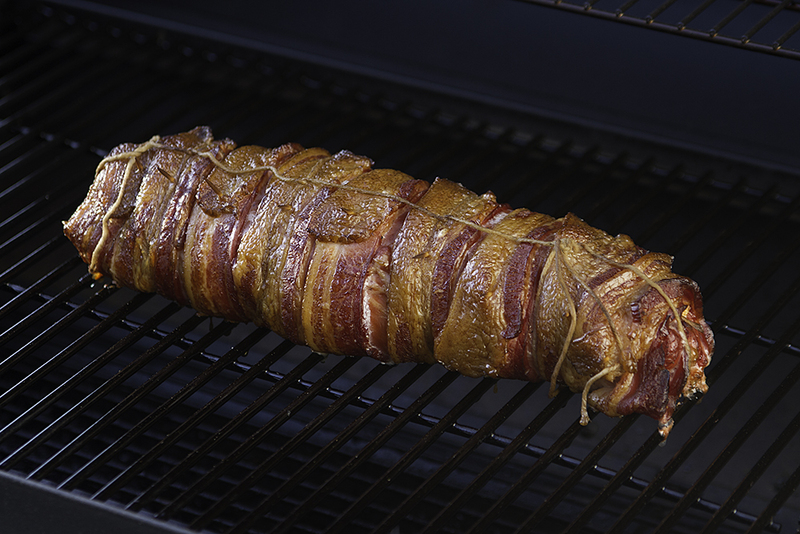 Wrap the entire tenderloin in bacon slices. Once the tenderloin is wrapped up, get your kitchen twine and start tying your roulade so it will stay rolled up during cooking. A few loops of twine around the tenderloin at even intervals along its length will do fine. Place the tenderloin in your smoker and smoke until an internal temperature of about 155 degrees is reached. (Mine took a little over 2 ½ hours). Remove the tenderloin from the smoker and carefully wrap in heavy foil, being careful not to puncture the foil with the tooth picks. Let stand for at least 15 minutes. To serve, remove the string and slice. Wash and clean the game hens and pat dry with paper towels. Pay extra attention to the cavity if you are opposed to any bits of organ meat. To make the stuffing: combine the goat cheese, cranberries, rosemary, salt, pepper and cinnamon. Blend gently with a fork. The seasoning for the game hens is made by combining the seasoned salt, paprika and cinnamon in a small bowl. Blend with a fork or your fingers. Stuff the body cavity of each game hen with the cheese mixture. Fill them completely. There should be enough stuffing for 4 game hens. Once the game hens are stuffed, use the toothpicks to hold the body cavity closed and tie the legs together with the kitchen twine. You can use the twine to help hold the cavity closed as well. Turn the wingtips behind the bird so they won’t burn while it is cooking. Gently coat the game hens with olive oil and liberally sprinkle with the seasoning-salt mixture. 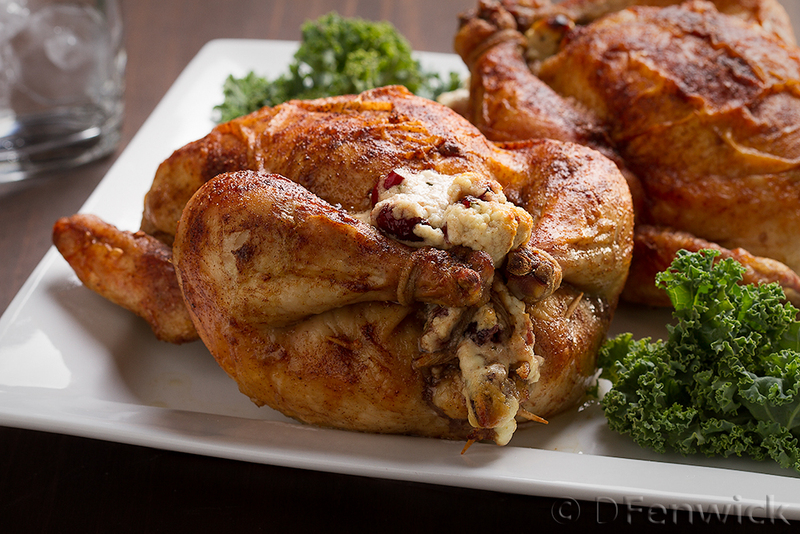 Place the game hens, breast up, on a cooking rack and bake for 1 1/2 hours or until a thermometer in the middle of the stuffing reads 165 degrees. Let the game hens rest for about 15 minutes and serve. If the game hens are very small, you can serve one per person. If they are larger, cut them in half and serve half a game hen per person. Note: When handling poultry, be sure to wash your hands often and discard any partially used ingredients that might have been touched after you have touched the poultry without washing. Be sure to thoroughly wash your cutting boards and any utensils used with the raw poulty. We use a clorox solution for extra peace of mind. Take an oven safe skillet, add 2 tablespoons olive oil and heat over medium high on your stove top. While the skillet is heating, skin your salmon (if it isn’t already) and cut it into serving sized pieces. Lightly salt and pepper the salmon. 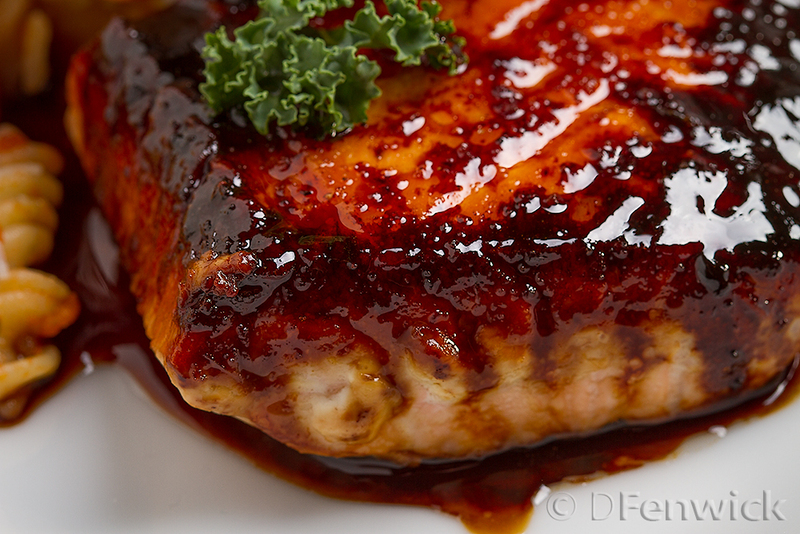 While the salmon is cooking, combine the soy sauce honey and ginger in a small sauce pan and heat just enough to get the honey to mix into the soy sauce. Carefully remove the salmon from the skillet and serve browned side up. Spoon a little more of the sauce over the salmon – and drool no more, just dig in! 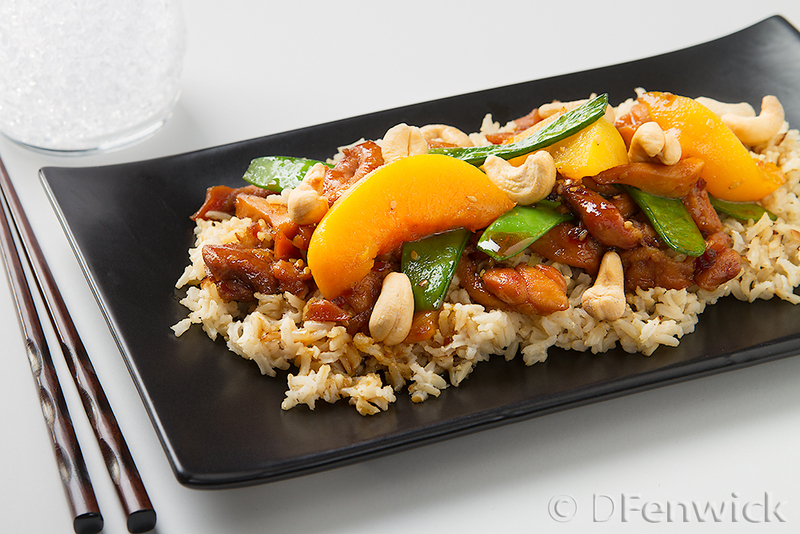 Instead of heading out to your local chinese fast food establishment, kick back at home with this quick and easy stir fry recipe. Not only will your tastebuds be happy, your wallet will be too! 1. Over medium heat – heat a skillet with a little oil in it. When hot add the garlic followed by the chicken. Cook the chicken, stirring frequently, until lightly browned. 2. Reduce the heat to medium low. Add the teriyaki sauce, the juice from the peaches and the grated ginger. Let simmer until thickened.